Here is the List of Best Free Keylogger Software for Windows. Most of these keystroke recorder software provide a bunch of PC monitoring options, which can help you keep an eye on what’s happening on your PC in your absence. These software can log keyboard strokes, clipboard, internet browser activity, emails, chats, instant messages, etc. You can also track program event history with some of the mentioned free keystroke logger software. Custom actions to log details for defined Users and Programs can be defined on some of these software. Another good feature that some of these keylogger program provide is, Screenshot option. This option takes screenshot of entire computer screen after every defined interval of time. Custom log options are available in some of the mentioned programs, which let you save log files after every defined interval. Most of the mentioned software are lite versions, hence provide limited functionalities, which sometime restrict screenshot option, auto email log file option, and stealth mode. The restricted options differ for every software. Stealth keylogger mode is enabled in few, while some need to be upgraded before you can make them go fully invisible. Keylogger software can come in handy in various cases. It can be used to keep an eye on children’s internet activity, as everything is easily accessible on the internet, so these can be used as kind of parental control software. Keylogger programs can be put to use in case you lost any important or personal data. As you have log of each keystroke, you can easily recover your data. These software are also sometimes used to monitor employee activity in organizations. Go through the list of these keylogger software to find out more about the keylogging and other features, and choose accordingly. I find Best Free Keylogger and SpyPal Spy Software as two of the best keylogger programs. Best Free Keylogger provides stealth keylogger feature along with various monitoring options and also lets you auto-uninstall itself. SpyPal Spy Software may not go fully invisible, but provides every other keylogging feature, along with unlimited screenshots and auto email/FTP setup to send logs. You can also checkout the list of best free Employee Monitoring Software, Parental Control Software, and On-Screen Keyboards for Windows. Best Free Keylogger is one of the best keylogger software available. The free to use version is a lite version of this software. Apart from being a keystroke recorder, it lets you record internet activity, social media chats, login IDs, passwords, and clipboard. You can take care of unnecessary monitoring by scheduling a task. Keylogger along with other monitoring activities can be scheduled to run on specific days and hours. You can also set this keylogger to log and monitor specific Users or Programs. The Invisible mode provided with this software is an added advantage. While it is recording keystrokes on a computer, the user will not be even aware if this invisible keylogger exists on that PC. It can be made visible by using a defined Hotkey combination. Auto uninstall feature is another plus point of this keylogger program. Simply define a date and time, if your system is on, the program will uninstall automatically. As everything is being logged and recorded, this software saves the log files with encryption. Screenshot option takes screenshot of computer’s screen, and can be set to take screenshots after specified time intervals. Sadly, the lite version lets you take only 10 screenshots/day. Pro version has no limit on number of screenshots taken. There’s one more limitation with the lite version, that you cannot send log files automatically via email or FTP. Manual access to recorded keystrokes is the only option. SpyPal Spy Software is a computer monitoring software which includes a keystroke recorder. It can record keystrokes and log them on your computer. Along with logging keystrokes, it can log email text, Facebook text, visited websites, chats, text documents, clipboard text, etc. Logs from this keyboard logger can be configured to send reports automatically via Email or FTP after every defined time interval. You can even opt not to store log files on computer hard disk after they are sent. 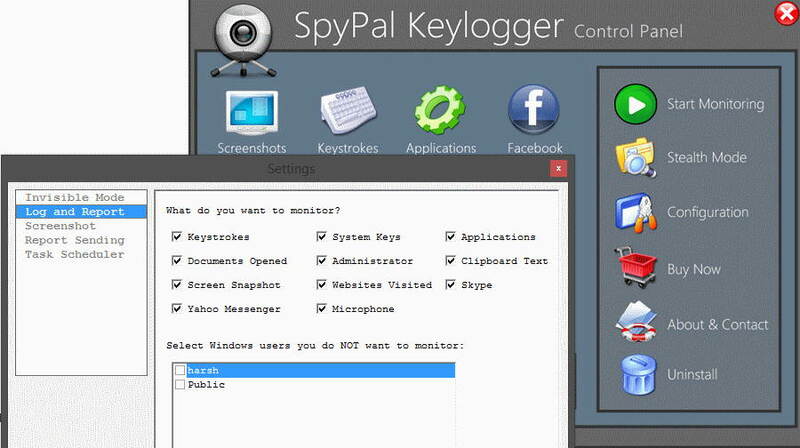 Unlike Best Free Keylogger, SpyPal lets you take unlimited custom screenshots. You can set it to capture the whole screen or just the top window after a defined time interval. Set screenshot image quality, resolution, and the maximum number of screenshots to be stored. This free keystroke logger lets you add exception for users you do not wish to monitor. It has stealth keylogger option, but its not activated in the free version. A small bar keeps floating on the desktop while the software is running. Windows Keylogger lets you log keystrokes, clipboard, internet usage, and applications used. The lite version of this software is available for free and does not lets you log screenshots and send reports via email and FTP. This keylogger is unique because it lets you schedule when to begin logging keystrokes. You can also selectively run it for defined users and applications. It goes in stealth mode and requires you to press a combination of hotkeys to make it visible again. To access it, you can set a password. Log keystrokes, clipboard, etc. on your computer in a desired folder. Auto removal of logs and limit for maximum log size can be set. Auto-uninstall is another bonus feature of this stealth keylogger. KISSKey Keylogger is a very simple and easy to use keystroke logger software. It is a free version and has some limited features. The interface is simple and gives you option to select a user to monitor. A toggle button is available to let you switch the logger On/Off. You can view the log anytime you want from the interface. It displays all the keystrokes recorded as TXT file. Logs can be sent manually through this keylogger, but to configure email to send log automatically, you will have to upgrade to pro version. All the saved logs can be deleted at once if you want. Invisible mode can be accessed once you have upgraded to the pro version of Kiss Keylogger. SGS KeyLogger provides keylogger and program event recorder services without password protection. It has just keystroke logging and program event logging options available, and its as simple as they come. It is designed to capture special keys, such as Ctrl, Alt, Enter, Backspace, Delete, etc. You can also view captured instant messages, chats, and emails exchanged from your computer. It saves both the logs on your computer. You can define maximum memory to be consumed by the files, maximum number of files to be stored, and the folder to store the log. A separate log for each hour is created once you hook the keyboard for logging. Free Keylogger provides a bunch tools to let you log keystrokes, record internet activity and program activity. All of it can be done with its stealth keylogger capabilities. Record keystrokes, log clipboard, record website activity, and program events with this software. You can hide this software and bring it back with a combination of defined Hotkeys. But, as this is a free version, there is a limitation that you cannot keep it invisible at Windows startup. There are various other interesting features which stay hidden unless you buy a pro version. These features include: sending report automatically, screen capture, both side chat/instant message recording, etc. Free Keylogger Gratis is another free keylogger software. It can record all keystrokes on your computer easily. Along with keystrokes, it also records internet browsing data by creating log of URL and page titles of visited web pages. Chats, passwords, emails, etc. are recorded as well with this software. It creates secret files for all recorded data, which you can view on its interface. This keystroke logger can be hidden or made visible with a special combination of Hotkeys. Free keylogger Gratis is a free version software with limited features, like you cannot send log files as email. 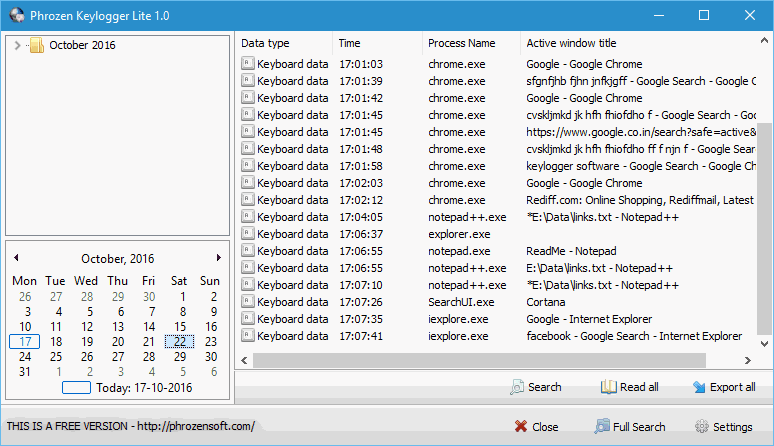 Phrozen keylogger Lite lets you capture all the keystrokes from a keyboard. Not only keyboard strokes, but clipboard, web address bar, and web search bar are also logged. You can also keep a track of applications used on your PC. You can easily hide and unhide this keystroke recorder using hotkeys. Log reports are easily accessible. Calendar wise reports can be viewed easily, directly from the interface. Option to export log reports as plain text or RTF files is available. OptimUser records keyboard strokes, applications run, and visited websites, then sends the data to a remote user. Its designed to work as employee monitoring software by keeping a track of their activity. Log reports can be sent on hourly, daily, or weekly basis. You will have to configure email to send reports automatically. Along with log files, it displays statistics with time spent on a website or program. It tags programs and websites as desirable, undesirable, or neutral. You can only use this keylogger program for non-commercial purposes.